It’s been just a few weeks since Anthem held its hands up and confirmed it had fallen victim to a cyber attack. 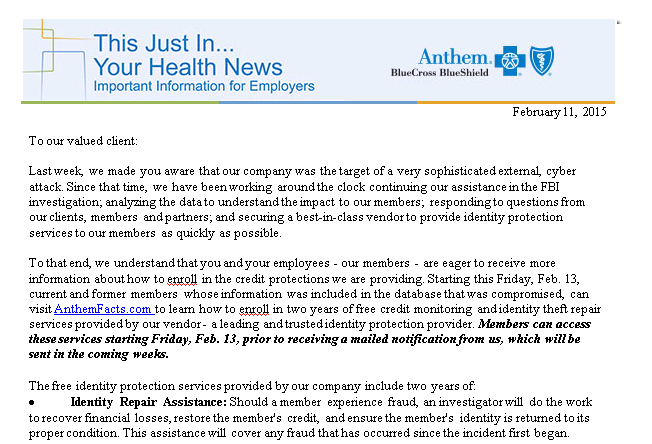 According to reports, the incident is the largest data breach ever to hit the US health care sector, with as many as 80 million current and former Anthem customer records affected. As reported by IT Security Guru earlier this week, investigators now believe the hackers somehow compromised the credentials of five different tech workers, possibly through a phishing campaign that could have tricked a worker into unknowingly revealing a password or downloading malicious software. The danger, as was the case with this email, is that the intended recipient mistook it for a genuine communication from Anthem and forwarded it to all employees within the organisation – in effect spreading the phisher’s net even wider plus potentially legitimising the scam. Of course spam remains as much of a problem as phishing. Research by Proofpoint revealed that the decline in the overall volume of unsolicited email was outweighed by a dramatic increase in maliciousness. Attackers generated more URLs (and sent each URL to a smaller number of recipients) in attempts to improve the chances of evading blocking by URL reputation filters, and the URLs generally used more sophisticated exploits. Also, the percentage of malicious URLs in unsolicited emails surged to an average of ten per cent in 2014 while by the end of 2014, malicious attachments played a much larger role in attackers’ campaigns, with banking Trojan, Dridex campaigns and other botnets attempting to send massive volumes of attachments and messages. Till next week, stay safe. The post Spam Gazing – Anthem breach double phishing whammy appeared first on IT Security Guru.